Standing alone in the heart of the Monument, Ragged Top is a widely visible and recognizable landmark. These images were taken from near the summit of Silver Bell Peak. 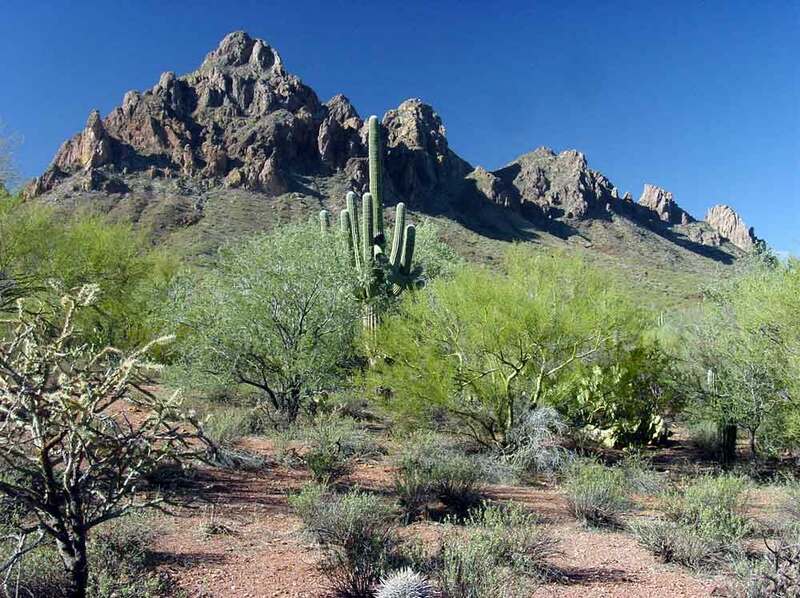 The Picacho Mountains are on the horizon in the right image with Picacho Peak in front of them. 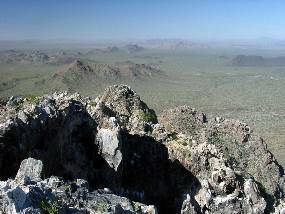 The short but strenuous rock-scramble to the summit rewards hikers with splendid views in nearly every direction. This view is to the northeast. The "X" to the left of the man's shoulder is the intersection of Silver Bell Road and the pipeline road. 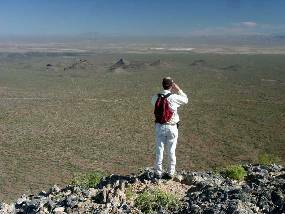 The white spots in the valley beyond the Samaniego Hills are the Pinal Air Park. 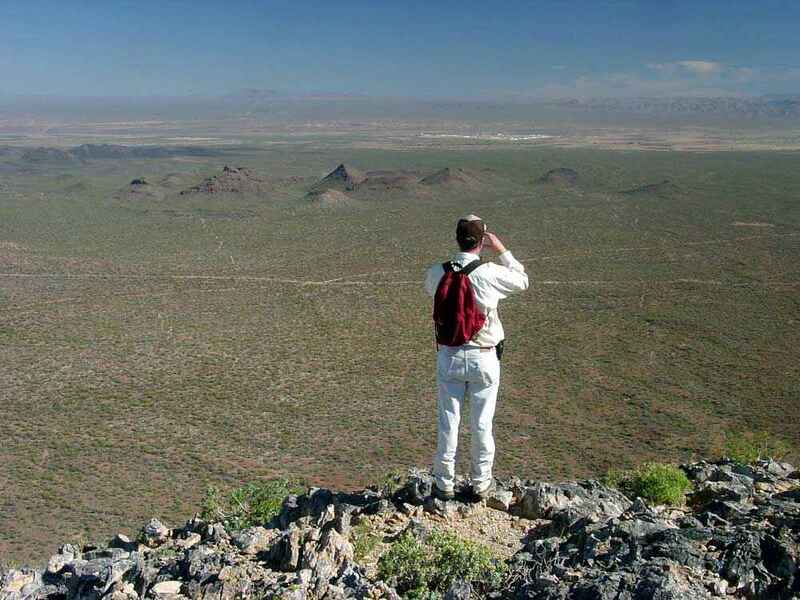 On the right horizon is the north end of the Santa Catalina Mountains with the Galiuro Mountains barely visible beyond them. 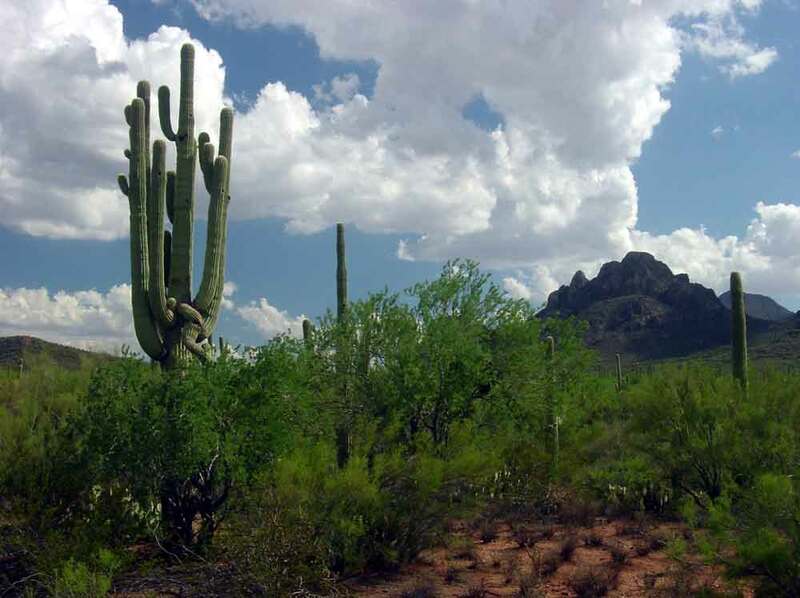 The bump on the horizon left of center is the Pichacho Mountains, with Picacho Peak State Park lost in the haze in front of them. 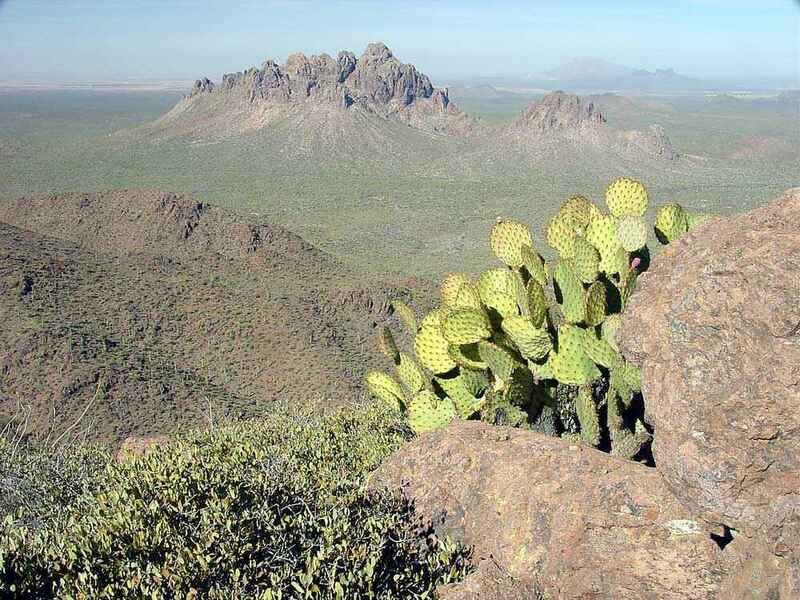 This view to the northwest looks at the backbone of the West Silver Bell Mountains that end at right-center with the light granite Solo Peak. (The peak just beyond Ragged Top is the northern end of the Silver Bell Mountains.) The dark hill at far right is Malpais Hill. The Sawtooth Mountains at the northwestern limit of IFNM are visible on the horizon beyond Solo Peak. The light patches beyond the mid West Silver Bell Mountains are agricultural fields in Aguirre Valley (outside the IFNM boundary). The intersection of Silverbell and Sasco roads is visible in front of Malpais. The views from the ground are some of the finest in IFNM. 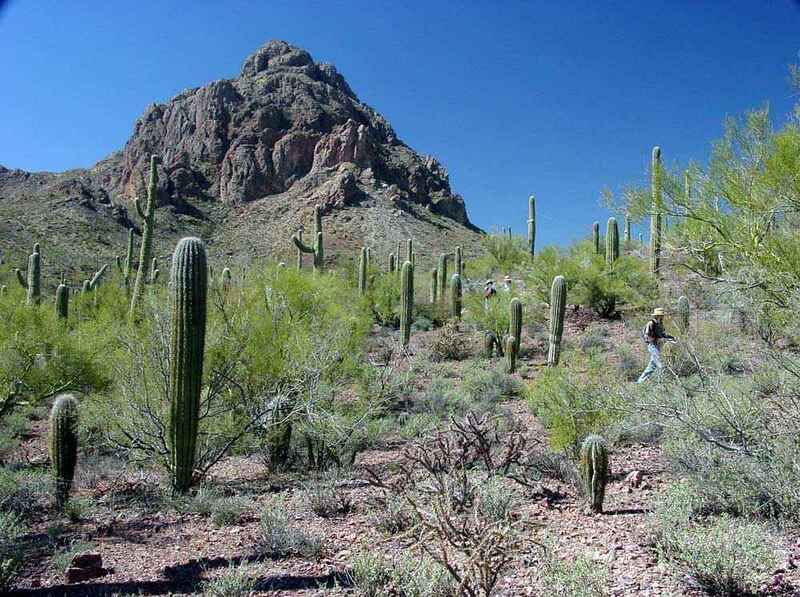 This is the north bajada of Ragged Top, in the midst of the best Arizona Upland and largest ironwood stands in the area. As in most of IFNM, few ironwoods attain large size. 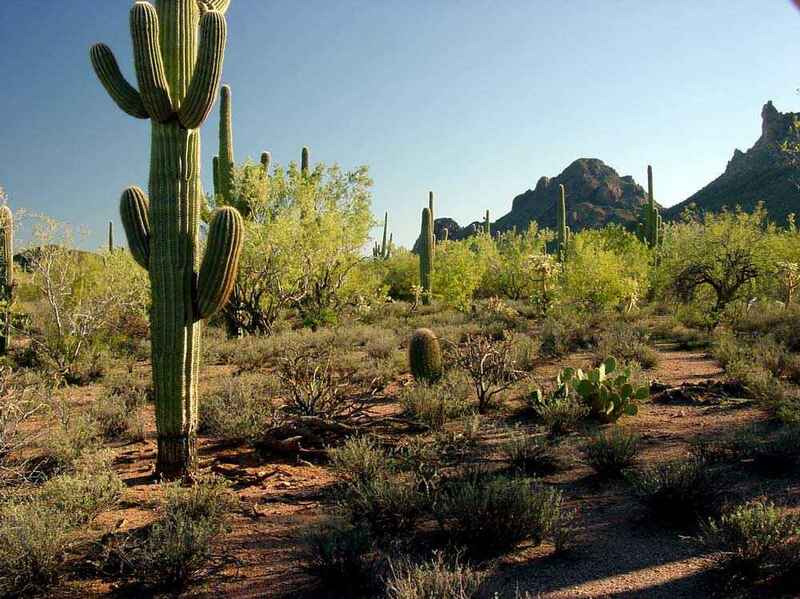 This region is distinguished in that its ironwood trees support a wider range of associate species than anywhere else in the Sonoran Desert region. Wolcott Peak is the eastern end of Ragged Top. 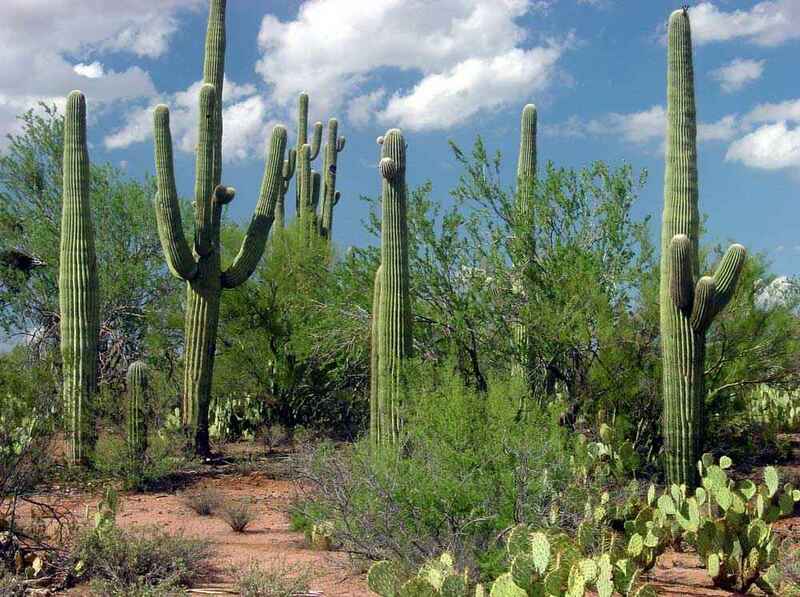 This area has a large number of young saguaros. The granitic soils around Ragged Top (which is itself mostly rhyolite) support dense stands of trees and saguaros. 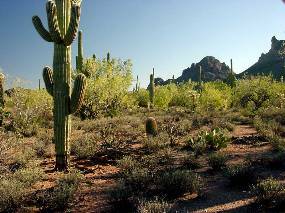 These trees, especially the ironwoods, shelter numerous species of shrubs and seedlings of larger plants such as saguaros. A very large saguaro grows out of a grove of ironwood trees near Ragged Top. Between tree-saguaro groves are more open areas with a somewhat different suite of plants. This view across the northern bajada of Ragged Top shows a small part of the dense Arizona Upland found in the heart of the Monument. 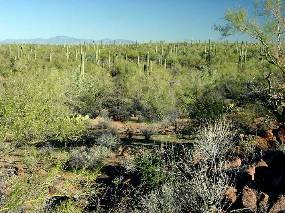 The yellowish, spiky trees are foothill palo verdes; the darker green, denser ones are ironwoods.